Thousands of customers, like Greg, depend on Metro transit every day to get to work, school and other important destinations. We hope you enjoy his story, and we’re interested in your transit story too. Email mrhibbard@metrostlouis.org, and we may share your story in a future “Passenger Profile” blog. Work begins the moment Greg steps onto a MetroLink train each morning. For three years, he’s been able to make his commute very productive, and he has no plans to stop anytime soon. Greg has about 30 minutes to complete a few tasks before stepping into work at the Washington University School of Medicine. His trip begins at the Fairview Heights MetroLink Station, where he boards a train and rides it to the Central West End MetroLink Station. “I decide what I want to focus on and what I want to do, without being interrupted by people in the office,” he said. 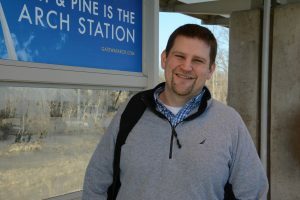 Greg said the commute to work is only a couple minutes longer than what it would take him to drive, but the benefits of transit far outweigh driving. 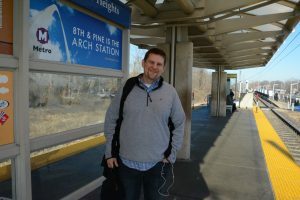 “It’s beneficial to the environment, I save time because I can work instead of driving and it’s convenient because MetroLink drops me off closer to work than the parking lot,” he said. As an employee of Washington University, choosing MetroLink is also a way to save money. Washington University picks up Greg’s transit tab as part of an employee benefit. In addition to using MetroLink to get to work, Greg uses Metro to visit the Saint Louis Zoo and Saint Louis Science Center with his family.